When I first bought these leopard print flats, I saw myself wearing them with plain outfits, to let them be the standout print. I decided to try stretch myself a little and wore some printed dresses with the leopard print shoes. Keeping things simple, I stuck with black and white dresses to match the colour of the shoes. I hadn't been feeling too well when I wore this - I'd been to the doctor the day before and was signed off for the day. I woke up expecting to feel better, still feeling pretty terrible. Got myself and the boys dressed and ready and dropped them off at daycare, where I was promptly asked if I was okay as I wasn't my usual self. Realised that all I wanted to do was go home and sleep so went home, let work know I wouldn't be in, and booked another appointment to see the doctor who then gave me more time off work. I wouldn't usually be so dressed up for a doctors appointment, but I'd planned my outfit before so it was easy to grab and go, and I had started the day not feeling too sick. 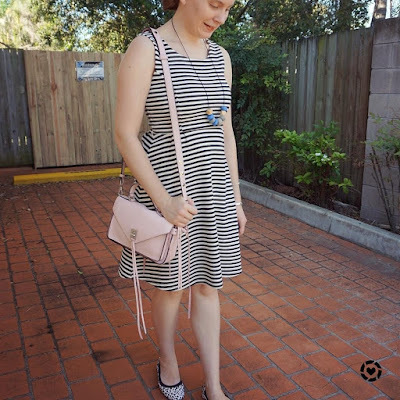 Does feel like this was a bit of a waste of an outfit as I really liked the print mixing with the striped dress and leopard print flats, and the pastel pink Darren bag was a cute addition. Ended up taking everything off when I got home and defaulting to trackie dacks to curl up on the sofa and doze and watch netflix! Last worn: striped fit and flare dress, bead necklace, Rebecca Minkoff small Darren. First time I've worn the leopard print flats on the blog as they are a recent purchase. Other ways to wear: striped fit and flare dress and purple bag, Rebecca Minkoff small Darren and pencil skirt. Perfect for pregnancy: striped fit and flare dress in second trimester. Felt much better when I wore this outfit! Unfortunately, the day was not any more fun! Had to go do my taxes. Not very exciting! We did do a little Christmas shopping afterwards, but came home empty handed. Since I liked the outfit combination above so much, I tried it again, with a black and white printed dress to compliment the black and white shoes. 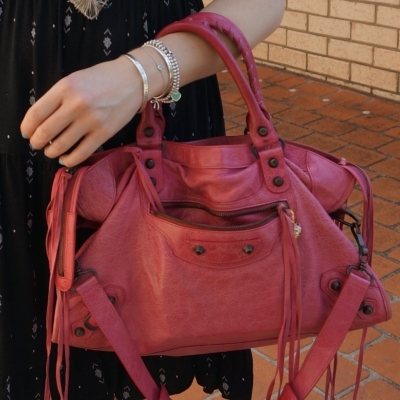 This time I went with a bolder pink bag, my sorbet Balenciaga city. Perfect size for holding all the paperwork I had to take to and from my appointment. I did just post this dress recently, but I love it in spring and summer. It's so light, fun to wear and it's a nice length for spending time with the boys - not too short! Kmart still sell them too - they have the same style in lots of different designs at the moment. Last worn: tiered dress, knotted heart necklace, leopard print flats (above), Balenciaga sorbet city bag. Other ways to wear: tiered dress layered for winter, Balenciaga sorbet city bag and sheath dress. Perfect for pregnancy: Balenciaga sorbet city bag in third trimester. It's easy to wear printed shoes with plain neutral pieces, but you can try something different by wearing them with a printed dress. To keep things simple and cohesive, pick a dress that matches the colours in the shoes. You can add a bright and colourful handbag to your outfit also as it can add interest to your outfit without clashing with the prints. 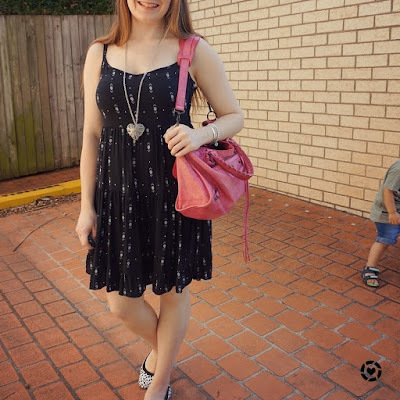 Linking up with Confident Twosday, Style Sessions, Trend Spin, Turning Heads. Congrats to Jaydee who won the Mater baby product hamper giveaway! Leopard prints indeed, look so chic and fierce! Love the looks, and you look beautiful, carina! Glad you found one! It can be tricky to find the perfect bag sometimes! Love both looks but that first one is my fave. I adore the combo of the black and white with the pink. That bag is perfect! I hope you are feeling better Mica. I love both dresses and the pattern mix of leopard to each look. I am a fan of stripes and leopard as it has worked out well for me too. Every time I see your Darren bag I want it more each time! Love the peony color. Happy Monday and hope your day is going well so far. I really love that first dress on you. It suits you so well! I love the mix of leopard flats with other prints and I do use them a lot when I'm wearing olive greens pants or shirts, too. I see in your list of leopard print flats for under $50 you've included the AEO flats. I've had these for years and they're so darned comfortable - I love them! And they're apparently on sale for $17.99 right now. I love your look and you did an amazing job of not looking sick in the first set! Leopard for the win! These are great flats for pairing with plains and prints. It's good you got a chance to rest up and recover while the boys were at daycare, a little doze is always a good idea when you're unwell! Yes it was nice to be able to do that - so rare to get to nap as a mum, haha! I see a cute little photo bomber in that last pic! :) Sorry to hear you were sick! That's no fun all. Both of these dresses are so cute and flattering. Love them paired with the pink bags! haha yes, the boys are never far away when I'm taking photos! Cute dresses. Love the stripes! You look beautiful in both dresses, but as I'm a big fan of stripes so the first one is my favorite. I love how you have styled both dresses perfectly. I'm in love with your Darren bag. Your shoes are so cute! NEW POST: VEGAS BABY | 4 LOOKS!! I love the mix! Those leopard print shoes are the cutest! SO chic, as always! YOUR BAGS <3 I wish I had such a collection! I own leopard flats that i wear only with black outfits. Maybe they wouldn't look too bad with some prints? These shoes are lovely and I like both outfits but second is my favorite. These are such a cute ballerina flats. I like leopard pattern and how you style it. Also you always have such a beautiful bags. I really like this one. Glad to hear you were feeling much better by the second outfit. Though getting your taxes done is never fun. You looked very stylish though. I love how went monochrome with your print mixing and added a pop of color with a pink bag in both of these looks. haha thank you, taxes are just one of those painful things that must be done! I’m glad you are feeling better!! I love how you are mixing prints, and I love the leopard shoes! I like that they are flat, I love flats that are a bit bold, and that stand out, they really make an outfit pop! And thank you for the list of leopard flats under $50! No worries :) They are definitely a fun addition to my shoe collection! I really like the white leopard print flats! I bet they are really versatile and perfect for the warmer weather with the lighter color! 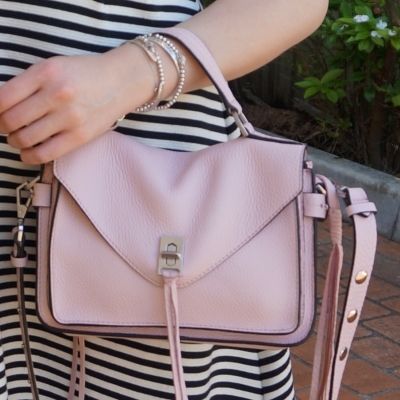 Love them with the striped dress and the pale pink bag in the first outfit! I love the striped dress. So sorry to hear you were feeling so bad, but glad it sounds you're feeling better! I LOVE your flats, Mica! They work so well with both dresses. Glad you're starting to feel better! Our house has been battling some never ending flu bugs lately too. You gotta love this time of year! I hope you feel better soon! Flu season is the worst! Great idea to toe the dress! You look fabulous in maxi dresses! Those are cute flats and both dresses went well with it. 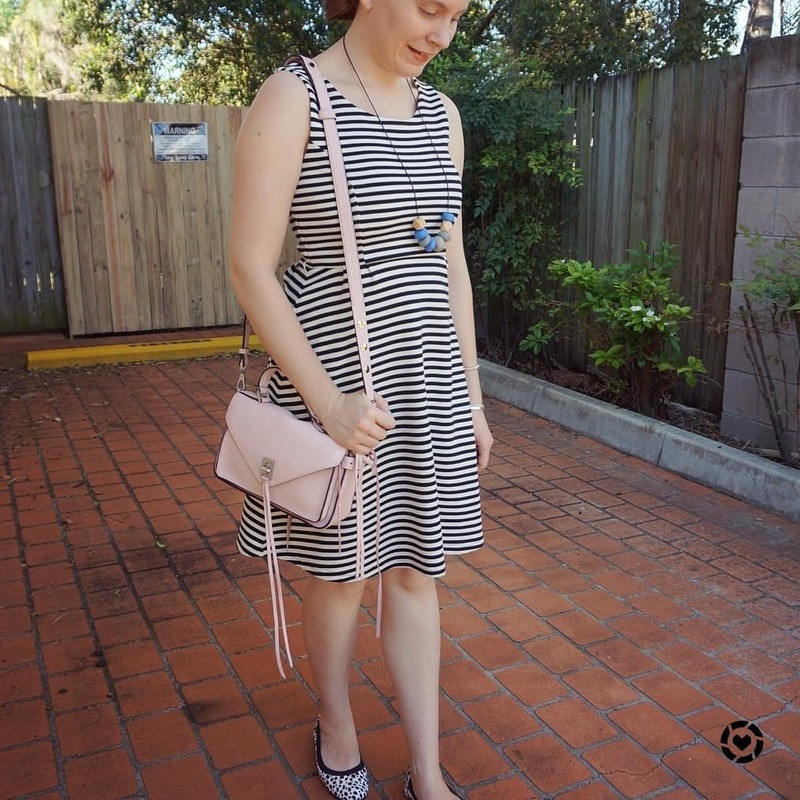 I like your pink bags, both have contrasting sizes but so fun and pretty. Hope you have a great midweek! I hope you're feeling better, Mica! I love your leopard flats paired with the striped dress! Oh Mica, I know what you mean about "wasting an outfit" - ha! I hope you feel better. I do love the pink bag of yours, such a pretty color. Of course I think anything pink is pretty - it's my FAVE!!! hehe, glad I'm not the only one who thinks that! I hope you're feeling a bit better - being sick is never fun! I'm glad you're feeling better, Mica!! Those shoes are wonderful, and I'm so glad you wore them with print dresses this way. And that's not really a waste of an outfit...at least you got a photo of it, and you can easily reproduce it now that you know it's a winner!! Yes I will have to rewear this again when I'm feeling better! So sorry you felt that bad on the day with the 1st look. But I understand you loved the look as it is a beautiful combination and therefore also the 2nd look is really my taste. The leopard flats are really perfect with these patterned dresses! I always consider leopard to be a neutral, and these flats are just fabulous on you! Pink bags always finish off a look nicely! Have a great week. The print mix was such a good idea- and it looks like you're having some warm + lovely summer weather! We're in the middle of fall-to-winter up here in the States and I'm already missing summer, haha! Definitely summer here now in Brisbane! We have a heatwave at the moment! Oh no!! I hope you are feeling better! I am loving both of these looks and totally jealous it is warm enough to dress so light! Awe, cute picks! Leopard is definitely becoming more of a staple in everyone’s closets! I like your look - subtle but classy! Those flats are so fun! I love the mix with that black and white striped dress--they work so well together! Sorry to hear you weren't feeling well though, I hope you're better now. Glad to hear you are feeling better. Also love how you paired the shoe with a fun print. This week has been crazy for us. With getting ready for Thanksgiving. Plus getting everything ready for me to go back to work next week. Both looks are great. Mixing prints works so well when they are in the same color family. I love that you kept both looks mostly black and white with a pop of color from your bag. I hope you are fully recovered by now. Being sick is never fun. I do love your outfits. Those leopard flats are adorable. They look great paired with that striped dress. It is a very subtle mix of prints especially since they match in colour. The second dress is beautiful as well. These pink hues are so pretty! I am loving seeing summery pinks at the moment since we're in freezing cold temperatures over here, ha ha. Love the stripes too, Mica! You're absolutely right about the second hand shopping. I know a couple of people who've bought preloved designer bags in good condition.